To the relief of pretty much everyone I seem to have come out the other side of the major dip this week – though not without giving my counsellor pause to wonder if it was sheer exhaustion rather than anything else that made me appear so calm when I met her on Wednesday. Sleep still isn’t fantastic, but I don’t seem to be quite as restless, which in turn is doing wonders for my mood as I have more energy in the morning to get up and get on with the day. So what’s in line for this weekend? Well we’re off tomorrow to MCM London, and the last touches are being put into place, along with some minor repairs and touch up of mask surfaces from the rigours of our trip to Fright Night. We’re going with Lady P who is a regular these days, and while it’s been a good few years since I’ve been to a comic convention, neither Lady M or my daughter have ever been, so this should be a remarkable experience for all concerned..! For the most part I just need to do a bit of repair to the papier mache edges of the mask where they’ve come unstuck – so a mix of sellotape, glue and ink is my arsenal of choice. Enhancements to the costume are also underway, and in this I’ve been lucky to be able to tap the expertise of my brothers. One of their myriad hobbies is the related field of LARPing, mostly being involved in the Aftermath LARP and wreaking havoc on a number of people while dressed as the most amazing array of characters and monsters. So who better to tap for some prop and costume elements? 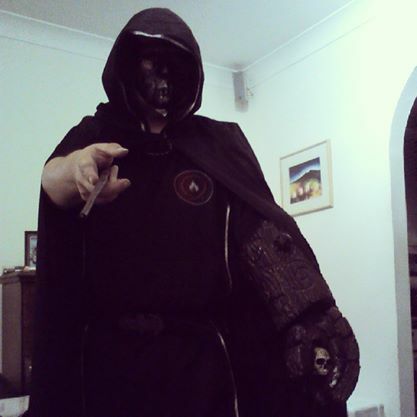 The result is a much more majestic affair, with a distinctive hand that resembles Hellboy’s Hand of Doom, and a hooded surcoat that I last wore to my youngest brother’s stag night on the South Bank. I’ve found a replica of the One Ring to wear around my neck, and will probably have a couple of spare wands tucked in my belt. The skull-topped cane that I bought for our Cambridge adventures, and that Lady M used while she was recovering from her foot injury fits nicely into the palm of the outsized glove too, because why not? 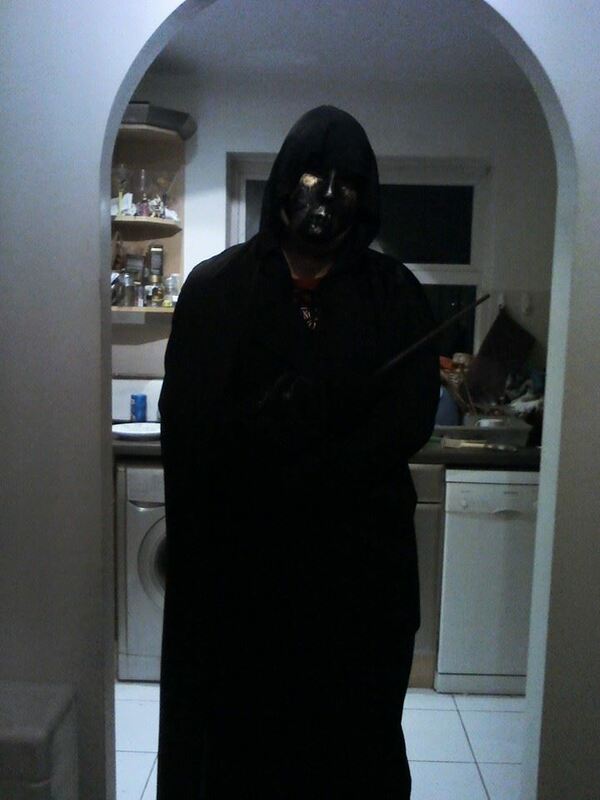 At this point I’m not sure if this character is a plain Death Eater or a rogue Auror. Depending on how my cold goes, I may limit the mask wearing to photos being worn, and I’ll certainly remove it when I’m talking to people at their stands. This entry was posted in depression, events, family, friends, Geekery, health, household, idle musings, mental health and tagged cosplay, family, geekery, health, household, idle musings, MCM London, mental health. Bookmark the permalink.